GOZUACIK LAB, CELLULAR STRESS AND DEATH RESPONSES: Basic autophagy research and its implications in human health and disease. “From high quality basic science to diagnosis and treatment of diseases”. -Discovery of novel drug targets and innovative patentable new drugs. In our lab, we discover regulators of stress responses and especially autophagy, including novel RNAs (e.g. microRNAs), proteins and metabolites, and characterize in detail their mechanisms of action and their implication in cellular and organismal pathways. Using our novel basic findings, we investigate how abnormalities of these stress responses are related to disease pathology, to disease progress, drug responses and prognosis. Based on our discoveries, we are also interested in finding new diagnosis techniques, drug targets and innovative patentable drugs. We routinely use molecular biology, genetics, biochemistry, cell biology and in vivo animal experimentation techniques (CAM assays, mice experiments) and patient-derived cell and tissue analyses. Therefore, our lab is a basic science and a pre-clinical medical research laboratory. We have established several interactive collaborations with world-class scientists working in different fields. Our collaborations with clinicians provide us with valuable clinical information and patient samples (tumors, blood, live cells etc.). Our collaborations with chemical engineers allowed us to develop innovative functional nano particles, nano drug carriers and nano diagnostics tools. Additionally, together with our collaborators, we could develop lab-on-a-chip devices and cellular chips with high-throughput screening and rapid disease diagnosis capacities. 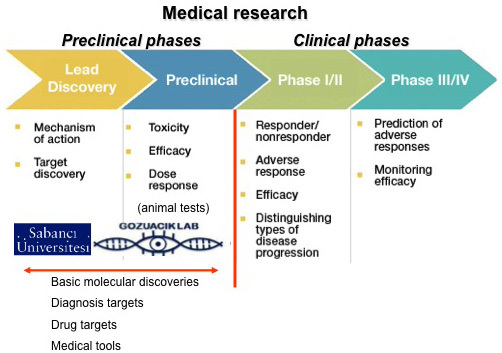 We hope to be able to bring results of our pre-clinical research efforts to clinical phases and patient usage through collaborations with clinicians and companies. Gozuacik Lab has privileged access to the EMBL Core Facilities in Heidelberg, Germany. Sabanci University is in close vicinity of Teknopark Istanbul, GOSB Technopark and Marmara Technopark (Teknokent), important science and technology parks in Turkey. Sabanci University research patents and outputs are commercialized with the help of its affiliated company Inovent. Our collaborators include Dr Jörn Dengjel (Friburg University, Switzerland), Dr Yoon Kyoung Cho (UNIST, S. Korea), Dr Ali Kosar (Sabanci University), Dr Havva Funda Yagci-Acar (Koc University), Dr Sinan Ekici, Dr Isin Dogan Ekici (Yeditepe University), Dr O. Ugur Sezerman (Acibadem University), Dr Hikmet Akkiz (Cukurova University), Dr Arzu Akcay (Ministery of Justice Forensic Medicine Institution), Dr Kubilay Kin (Ministery of Justice Forensic Medicine Institution), . Gozuacik Lab is part of the EMBO Cancer YIPs Group (Several cancer labs all around EU) and Proteostasis COST Network and Transautophagy COST Network. We are a co-founder and a member lab of the YÖK-approved Sabanci University Center of Excellence for Functional Surfaces and Interfaces for Nano Diagnostics (EFSUN). For our selected publications click here. For a full publication list click here. For our recent microRNA-based drug-diagnosis patent click here. For our awards click here. For TV and newspaper news about us click here. Keywords: What is autophagy? Otofaji nedir?